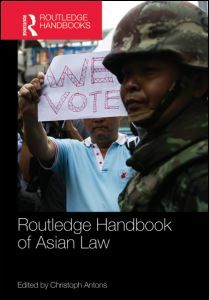 "Constitutions, Constitutional Practice and Constitutionalism in East Asia"
in Christoph Antons (ed), Routledge Handbook of Asian Law (Routledge, Nov 2016), pp 75-93. Abstract: The constitutions and constitutional practices of states in East and Southeast Asia (hereafter 'East Asia') provide worthwhile case studies for scholars of comparative constitutional law, constitutional theory and politics. This chapter seeks to provide a conceptual framework for such comparative studies and discuss some key components of the existing literature on the subject. It is hope that the chapter can serve as a point of departure or guide for further research into the topic. Given space limitations, the treatment in this chapter is necessarily selective and incomplete, in terms of both the countries and the literature included in the discussion.